All transactions are safe and secure with a reliable history in online purchasing behind each of our associates. Buy the Don Zombie Godfather t-shirt to own Godfather clothing and merchandise. Always remember to never take sides with anyone against your family ever. Now only if Santino, Don Vito, Michael and Fredo could all follow that advice, then things would work out better for them. 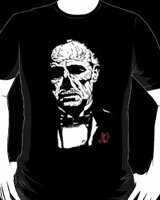 The image of Don Vito (Marlon Brando) as a zombie adds a bit of fear to this unique piece of Godfather clothing that comes in a variety of sizes. Wear it to let everyone know that Don Vito has come back from the dead. Pair it with a puppeteer logo design for an intimidating clothing combination. In addition to the Don Zombie Godfather tee above, browse the Godfather Clothing Gallery for more apparel like men's and women's clothes, kids shirts or hoodies.